This article is about the 1987 Tamil film. For other uses, see Nayakan (disambiguation). Nayakan (lit. The Hero; also spelt Nayagan) is a 1987 Indian Tamil-language gangster film written and directed by Mani Ratnam.It stars Kamal Haasan and Saranya in lead roles. It is loosely based on the real-life Bombay underworld don Varadarajan Mudaliar, and sympathetically depicts the struggle of South Indians living in Bombay (now Mumbai). The film also stars Saranya Ponvannan in her film debut. Karthika, Nassar, Janagaraj, Delhi Ganesh and Tinnu Anand play significant roles. The soundtrack and the background score of the film, composed by Ilaiyaraaja were critically acclaimed and considered by critics as one of his best works to that point. Nayakan was released on 21 October 1987 on the occasion of Diwali and received critical acclaim. Haasan's performance earned him the National Film Award for Best Actor. The film also earned the National Awards for Best Cinematography (P. C. Sriram) and Best Art Direction (Thotta Tharani). The film was India's official submission for the Academy Award for Best Foreign Language Film in 1988 at the 60th Academy Awards, but was not nominated. In 2005, the magazine TIME included Nayakan in its list of "All-Time 100 Best Films". The film was also included in The Moving Arts Film Journal's list of greatest films of all time. Nayagan was also included in NDTV's list "India's 20 greatest films". CNN-IBN included the film in its list of "100 greatest Indian films of all time". The film was dubbed in Telugu under the title Nayakudu. It was also remade in Hindi as Dayavan in 1988. A Hindi dub of the film was released in 1999 as Velu Nayakan. An anti-government union leader's only son Sakthivel is arrested by the police to find his whereabouts. They trick Sakthivel into believing them as his well-wishers and release him. When Sakthivel meets his father, the police kill the latter. Feeling betrayed, Sakthivel stabs the police inspector and runs away to Bombay, where he is raised by Hussain, a kind-hearted smuggler living in the Dharavi slums. One day, when Hussain is ill, Sakthivel, now a young man, decides to carry out the smuggling activity on behalf of Hussain. His demand for a bigger commission from the smugglers makes them furious and they involve a police inspector Kelkar to arrest Hussain and kill him in jail. When they close the case as suicide, Sakthivel is angered knowing the truth and murders Kelkar. He later takes care of Kelkar's family which consists of his wife and a mentally challenged son Ajit. Kelkar's wife knew that her husband's immorality resulted in his death. Sakthivel meets Neela, a schoolgirl forced into prostitution who has interests to pursue her education. Her innocence impresses Sakthivel who marries her. They have two children: Surya and Charumathi. Sakthivel's power and command gradually increases in Dharavi as he voices out in support of local people which gains him huge popularity among the masses. His rival smugglers in Bombay try to murder Sakthivel in an attack but Neela is killed instead. Sakthivel sends his children to Chennai to safeguard them. As the years pass, Sakthivel's power further increases in Bombay and is fondly called "Velu Naicker" by everyone. Surya and Charumathi return to Bombay as adults after education. Surya follows Sakthivel's footsteps which makes him feel proud. But when Surya is killed by a gang during a clash, Charumathi blames Sakthivel for the deaths of Neela and Surya. She wants Sakthivel to leave Bombay and start life afresh, which he refuses to do. Charumathi disowns her father and leaves his home. Some years later, a new assistant commissioner of police is deputed in Bombay to eliminate the gangsters and his first target is Sakthivel. He collects all the evidence needed for the arrest of Sakthivel. When Sakthivel comes to meet him, he learns that Charumathi is married to him and they have a son. The assistant commissioner too learns that his wife is Sakthivel's daughter and suspects that she might help her father to flee from the police. Sakthivel absconds and his allies are arrested. He decides to surrender to the police to save them from undergoing torture in the police station. Through Charumathi, Sakthivel informs her husband about his hide out place and is arrested. The assistant commissioner is shocked due to lack of proper evidence against Sakthivel as none comes forward from the public as witness against the crimes committed by him. The assistant commissioner meets Kelkar's wife and the now grown-up Ajit and requests to disclose the truth behind her husband's death in the court. She refuses and defends Sakthivel's acts. But Ajit is shocked after learning the truth. Sakthivel is produced in the court and is exonerated due to lack of valid and strong evidence. Sakthivel steps out of the court amid big cheer from his supporters, until Ajit shoots him to avenge his father's death; Sakthivel dies on the spot. Kuyili in a cameo appearance in "Nila Adhu Vanathumele"
"The two years I studied in Bombay (1975–77), he [Varadarajan Mudaliar] was at his peak. People in the Matunga belt thought he was God. I used to wonder how anyone could treat a fellow human as God. I never understood why they would do this. It fascinated me. It was such a dramatic story, this man going from Tamil Nadu to Bombay and ruling the city. I outlined this thought to Kamal Haasan and he said fine. That's it. It was done. Decided." In the mid 1980s, Muktha Srinivasan narrated a story inspired by the American film The Godfather to Sivaji Ganesan who agreed to act in the film. Amala and Kamal Haasan were also confirmed to act. However Ananthu, then an associate of Haasan, felt that it would be a Ganesan-focused film and not a Haasan film. The project was dropped. Haasan later told Srinivasan about the-then upcoming director Mani Ratnam. Ratnam had previously wanted to cast Haasan as the protagonist in his directorial debut, Pallavi Anu Pallavi (1983), but the collaboration could not materialise then as Haasan was committed to Raja Paarvai (1981) at that time. Srinivasan came to Ratnam's house and gave him an envelope, which contained a cassette of Pagla Kahin Ka (1970). Ratnam, after watching the film, met Haasan and initially rejected the offer, citing that a story based on Pagla Kahin Ka was not his cup of tea. After Haasan asked him the kind of film he preferred to make, Ratnam suggested two stories: one was on the lines of Dirty Harry (1971) and Beverly Hills Cop (1984), while the other was based on the life of underworld don Varadarajan Mudaliar; the latter was finalised. Ratnam had earlier narrated this story, when it was only an idea, to producer R. C. Prakash, but it was not picked up then. In September 1986, Haasan gave his schedule dates for the film to Srinivasan. Ratnam wanted Haasan to have as realistic a look as possible. He preferred Haasan in traditional Hindu attire. Haasan was initially hesitant regarding his look and wanted to sport a beard similar to that of his old-aged look in Sagara Sangamam (1983), as he felt it would not give away his jaw line, which would reveal that the character was portrayed by a younger person. Ratnam, in turn, did not want Haasan to sport a look similar to Sagara Sangamam or any of his other previous films. Haasan sported dentures to provide some weight around his jaw for Velu Nayakan's old-age look. Neela, the wife of Velu Nayakan, played by Saranya Ponvannan, who made her debut in the film, was created by Muktha Srinivasan as he felt that without the character, the film would have had more violent content and that it would not cater to family audiences. Ratnam wanted a "new face" to portray Neela as he felt the character would have the required zest and gusto if it was done by a newbie. Debashree Roy claimed that she was approached to play this character, but refused as she considered that speaking in Tamil would be difficult for her. Saranya sent her photograph to Ratnam to audition for the role. She was later added to the cast after a successful screen test. According to Ratnam, she was the first and only person who auditioned for the role. Saranya's father was against her being cast, but she and her mother managed to convince him. Ratnam believes that Nassar was suggested to him by Haasan, when Raghuvaran was being considered for the role of Charumati's husband. Kuyili made a cameo appearance in the song "Nila Adhu Vanathumele" as a gypsy dancer. Actress Tara featured in an extended cameo appearance as Shyla, while Tinnu Anand featured as Ajit, the son of a police officer murdered by Velu. Ratnam initially planned to complete the shooting in 60 days and 70 rolls of film. Haasan was paid ₹1.75 million (US$145,583 in 1987)[b] and the initial budget for the film was ₹6 million (US$500,000 in 1987). [b] But soon, time and cost overruns had increased the budget to beyond ₹10 million (US$830,000 in 1987). [b] According to Srinivasan, principal photography commenced in November 1986 and the first schedule lasted for 10 days, but the scenes shot during this period were scrapped because Haasan disliked them, prompting script rewrites and causing shooting to be delayed. According to Ratnam, a three-day test shoot, unbeknownst to Srinivasan, was done in December 1986 as the script for the film was not finalised at that time. The test shoots featured Haasan in his get-ups seen in the film, but they did not make it to the final version of the film. The test shoots, however, helped to get the technical aspects of the film on the right track. Ratnam said the first "real schedule" of Nayakan began in January 1987. 15 days of shooting took place in the slum areas of Dharavi. Using photographs taken there, the film's art director Thota Tharani created a set at Venus Studios in Chennai. Thousands of junior artists were hired to recreate the atmosphere of the slum areas. Additionally, pigeons were brought for the same. Haasan helped in the make-up for the other actors in the film and asked Janagaraj and Delhi Ganesh to cut their hair so as to make their characters in their old age scenes look convincing. He used Ittar perfume for the female cast. Haasan also brought his own gun, sparing Ratnam the usage of a dummy. In the scene where Haasan chases the inspector, he uses his own bottle of sugar glass, which he had brought from the United States. Ratnam had marked around ₹1.2 million (US$100,000 in 1987)[b] for the film's action sequences. To make the sequences slick and entertaining, cinematographer and stunt sequence director Jim Allen, who was known for his work stunt sequences in Sholay (1975) was chosen. But after three days, he was removed from the film as he charged ₹200,000 per day (US$16,000 in 1987)[b] and Srinivasan could not afford the money. The remaining portions were shot at Bombay (now Mumbai), including the portions involving Velu Nayakan's childhood life in the city. The scene featuring Neela studying for her mathematics exams was suggested by Srinivasan. Velu's childhood portions before he moves to Bombay were canned in Old Mahabalipuram Road for one and a half days. This was also the last part of the principal photography. According to Srinivasan, the film was completed in October 1987. The song "Naan Sirithal Deepavali" was shot at the spot where the Taj Club House is located today. The old building previously located at that spot was called the "Indian Express Building" by film industrialists as it was adjacent to the Old office of the Indian Express. Thota Tharani converted the building's exterior into a brothel and used the opposite end of the building for Velu's house location. Nayakan was notable for using frame-within-the-frame technique of filmmaking. Ratnam and Haasan met Varadaraja Mudaliar in person and it was Mudaliar who suggested to Ratnam that Velu Nayakan should die in the end when Ratnam asked Mudaliar how he would foresee his own death. When the film was completed and the first print was ready, it ran for three hours. Although Ratnam and Haasan wanted Srinivasan to release the film uncut, he felt audiences would never see the entire film due to its length, so he requested the film's editor B. Lenin to remove the scenes which he felt were unnecessary. The result, according to Srinivasan, "gave life to the movie, along with the theme music Thenpandi seemayilae." Although Kamal has acknowledged to Nayakan being inspired by The Godfather, Ratnam has denied this, stating, "It's easy to classify films in simple categories. Nayakan and The Godfather belong to the gangster genre. There's no similarity to The Godfather." Apart from The Godfather, Srinivasan cited Once Upon a Time in America (1984) as another influence on Nayakan. One scene in the film involves Velu and Selvam tying their illicit cargo to large bags of salt attached to rubber inner tubes which they then dump into the sea; the cargo sinks from the weight of the salt, but when the salt dissolves the cargo bobs to the surface, by which time they have passed the customs officers. This scene was described by Lalitha Gopalan in her 2002 book Cinema of Interruptions as an homage to Once Upon a Time in America, a view that was shared by S. Shiva Kumar of The Hindu. According to film historian S. Theodore Baskaran, the film "tends to glorify violence and portrays the anti-social, smuggler-king in an approving and sympathetic way, modelling him on Robin Hood." Lalitha Gopalan notes that the film "attempts faithfully to re-create a historical period by carefully managing different aspects of the mise en scène. More than any other detail in the mise en scène, automobiles – different models of cars, jeeps, and vans – indicate the passage of time within the diegesis." The soundtrack was composed by Ilaiyaraaja, this being his 400th film soundtrack. Pulamaipithan wrote the lyrics for all the songs except "Nila Adhu Vanathumele", which Ilaiyaraaja himself wrote. The theme song "Thenpandi Cheemayile" plays for most of the film; during the introduction titles, it has the colloquial line "yaar adichaaro" (sung by Ilaiyaraaja), but when it plays later in the film, the line is altered to the more polished "yaar adithaaro" (sung by Haasan). Film critic Baradwaj Rangan asked Ratnam whether this change was an indication to the eventual refinement of Velu Nayakan. Ratnam said that Ilaiyaraaja's portions were recorded first, and that when they went for recording, they had this rustic version which lacked background music, and was of folk quality. Because the song was going to be repeated throughout the film, they also wanted a more orchestral version, and in this version sung by Haasan, the language became more sophisticated. The song "Nee Oru Kaadhal Sangeetham", which is based on the raga Kalyani, is featured on both sides of the original LP record as the second track. For the Hindi dub, composer duo Deepak-Santosh were approached to replace two numbers. The song "Chaha Humne Tujhe" served as a replacement for "Nee Oru Kaadhal" from the Tamil original. However, the original song was dubbed in Hindi as "Jeevan Ka Sangeet" and is included in the version's soundtrack. "Sitam Ki Andhi Se" is another song that replaced "Thenpaandi Cheemayile" from the original. Nayakan was released on 21 October 1987. The Censor Board at Chennai initially refused to permit the release of the film, as it was based on a living person. When Srinivasan appealed to the revising committee at Bombay, they said that they would permit the release of the film he produced a letter stating that it was not based on Mudaliar's life. Through writer Mathiolli Shanmugam, Srinivasan met Mudaliar, who gave him a letter, after which the censor appellate board at Bombay permitted the release of the film. G. Venkateswaran bought the rights of the film after Srinivasan distributed the film. The film was a commercial success, running for over 175 days in theatres and thereby becoming a silver jubilee film. [c] It was later remade in Hindi as Dayavan (1988), which was a critical and commercial failure. In 2015, Nayakan was screened at the Habitat Film Festival. Nayakan received critical acclaim. In October 1987, N. Krishnaswamy of The Indian Express said, "[Nayakan] is a rare Tamil film. Sensitivity is its hallmark. Authenticity is its lifebreath. It has the stamp of nativity. It has class. Yet, it is not an Art film. It could be a watershed in Tamil cinema; an artistically made film that could make money as well." On 1 November 1987, Ananda Vikatan stated that Haasan underplayed his role well and demonstrated his histrionics as a godfather in the film well, adding that the film stood out for its sets, taking, colour, richness and international quality camera work. The magazine gave the film one of its highest marks of 60. Writing for India Today in 1989, Madhu Jain believed Nayakan deserved "a permanent place in the Indian cinema pantheon" after watching it at the 12th International Film Festival in Delhi. Film critic Isbal Masud, writing in the book Cinema in India (1988), described Nayakan as a "landmark" of popular Indian cinema. English journalist Phil Hardy stated in his 1997 book The BFI Companion to Crime, "From the films that followed in the wake of The Godfather, the most interesting is Mani Rathnam's Nayakan (1987) starring [Kamal Haasan] in a fictional version of the Bombay gangster Varadarajan Mudaliar's life." A 1988 review published in Bombay: The City Magazine described Kamal as having given a "powerhouse performance". At the 1987 National Film Awards, Nayakan won the awards for Best Actor (Kamal Haasan), Best Cinematography (P. C. Sriram) and Best Art Direction (Thotta Tharani). The film was India's official submission for the Academy Award for Best Foreign Language Film in 1988 at the 60th Academy Awards; however, it was not shortlisted among the final nominees. As a part of its legacy, the film has been acclaimed for being a box-office success whilst containing the critic elements of art. In 2005, the magazine TIME included Nayakan in its list of "All-Time 100 Best Films". After the film was selected by TIME as one of the best, insiders of the magazine spoke about Ratnam's work in the film, saying "Ratnam has no such difficulty blending melodrama and music, violence and comedy, realism and delirium, into a two-and-a-half-hour demonstration that, when a gangster's miseries are mounting, the most natural solution is to sing in the rain." The tagline given to the film by TIME was "A terrific gangster epic in the Godfather style." The film was also ranked 13th in The Moving Arts Film Journal list of greatest films of all time. Nayakan was also included in NDTV's list "India's 20 greatest films". In April 2013, on the centenary of Indian cinema, CNN-News18 included the film in its list of "100 greatest Indian films of all time". The famous line in the film, "Neenga Nallavara Kettavara?" (Are you good or bad?) was used in "The Punch Song", a song from the film, Aaha Kalyanam (2014). A poster of the film, designed by Abhinav Bhatt from Bangalore depicted Velu Nayakan being asked the line by his grandson. When questioned by Baradwaj Rangan if he would make a sequel to Nayakan, Ratnam said, "Never. When you finish a film, you're glad to be rid of it. You're happy you don't have to go back to that script again. Been there, done that." The scenes and dialogues from the film have been parodied in Dumm Dumm Dumm (2001), Chellame (2004). When stand-up comedian and television anchor Bosskey launched a quirky play titled Dada (Don) in October 2005, he named the cast after famous characters in Tamil films. Accordingly, Anniyan (one of Vikram's character in the film), Badshah (Rajinikanth in Baashha) and Velu Nayakkar (Haasan's role in Nayakan) play the central characters of a family of brothers. Similarly, in the 2013 comedy film Onbadhule Guru, in which the characters were named after popular protagonists of Tamil cinema, a member of the supporting cast was christened Velu Nayakkar. According to the Telugu newspaper Eenadu, Rajinikanth, after being impressed with Nayakan, requested Ratnam to write a similar script, but the project never materialised; its similarities with Pa. Ranjith's script for Kabali (2016) made him accept to star in the latter film. In October 2012, coinciding with the 25th anniversary of Nayakan Haasan published an article in The Hindu, titled "Of course Velu Nayakan doesn't dance", in which he recounted the making of the film. In that article, he derided Srinivasan, claiming that the latter was not happy about shooting the film in Bombay, that films "were a business" for him and he "wasn't interested in films as art". In response, Srinivasan sent a legal notice to Haasan. He stated, "[Kamal Haasan] has abused me in his article, and this has deeply hurt me. I've been unable to do my job ever since I read the piece." Srinivasan wrote an article titled "Living in past glory", his rejoinder to Haasan's article, in which he accused Haasan of "distorting the facts for reasons best known to him, and undermining the contributions made by everyone." He did, however, conclude by writing that he was not against Haasan taking credit for the film's success, as long as it was not at his expense. ^ While the book Conversations with Mani Ratnam gives the film's run time as 135 minutes, Encyclopedia of Indian Cinema says it is 155 minutes long. ^ a b c d e The exchange rate in 1987 was 12.9658 Indian rupees (₹) per 1 US dollar (US$). ^ A silver jubilee film is one that completes a theatrical run of 175 days. ^ a b c d e f g h i j k l m n Rangan 2012, p. 290. ^ a b Rajadhyaksha & Willemen 1998, p. 480. ^ a b c Rangan 2012, p. 44. ^ a b c d e f g h i j k l m Srinivasan, Muktha V. (28 October 2012). "Living in past glory". The Hindu. Archived from the original on 7 March 2014. Retrieved 5 April 2013. ^ a b c d e f g h i Haasan, Kamal (20 October 2012). "'Of course Velu Nayakan doesn't dance'". The Hindu. Archived from the original on 12 June 2013. Retrieved 20 October 2012. ^ Rangan 2012, p. 42. ^ Giovanna, Maria (30 April 2008). "Making movies with Mani Ratnam". Rediff.com. Archived from the original on 18 August 2017. Retrieved 25 April 2018. ^ Rangan 2012, pp. 46–47. ^ Rangan 2012, p. 47. ^ Rangan 2012, p. 51. ^ "If only..." The Telegraph. 1 October 2008. Archived from the original on 9 April 2017. Retrieved 8 April 2017. ^ Rangan 2012, p. 52. ^ Vaishnavi. ""I am craving to work with Mani Ratnam sir once again"". Behindwoods. Archived from the original on 9 May 2016. Retrieved 9 May 2016. ^ Rangan 2012, p. 64. ^ Kumar, S. R. Ashok (29 April 2010). "Grill Mill – Kuyili". The Hindu. Archived from the original on 19 October 2014. Retrieved 19 October 2014. ^ Kuhajane, Muralidhara (14 March 2012). "Time to give back to film industry: Tara". The Hindu. Archived from the original on 19 October 2014. Retrieved 19 October 2014. ^ "Exchange Rate of the Indian Rupee Vis-a-Vis the SDR, US Dollar, Pound Sterling, D. M./Euro and Japanese Yen (Financial year – Annual average and end-year rates)" (PDF). p. 264. Archived from the original (PDF) on 17 April 2012. Retrieved 20 October 2014. ^ a b Rangan 2012, p. 45. ^ Rangan 2012, p. 59. ^ a b Rangan 2012, p. 46. ^ a b Rangan 2012, p. 60. ^ Rangan 2012, p. 54. ^ Rangan 2012, p. 58. ^ Jha, Subhash K. (16 November 2013). "Was 'Nayakan' inspired by 'The Godfather'?". Daily News and Analysis. Archived from the original on 25 September 2017. Retrieved 28 November 2017. ^ Gopalan 2002, pp. 117-118. ^ Kumar, S. Shiva (5 October 2018). "Mani is the matter: on Chekka Chivantha Vaanam". The Hindu. Retrieved 19 October 2018. ^ Baskaran 1996, p. 163. ^ Gopalan 2002, p. 116. ^ "Nayagan songs tracklist". Raaga.com. Archived from the original on 20 October 2014. Retrieved 20 October 2014. ^ Gnani (9 January 2011). "திருப்புமுனை திரைப்படங்கள்" [Pathbreaking films]. Dinamani (in Tamil). Archived from the original on 29 June 2016. Retrieved 29 June 2016. ^ a b Ilaiyaraaja (1987). "Nayagan". Echo Audio Company. Archived from the original on 17 December 2013. ^ Rangan 2012, p. 53. ^ Manigandan, K. R. (8 March 2012). "Shot Cuts: Blessing in disguise". The Hindu. Archived from the original on 19 October 2014. Retrieved 19 October 2014. 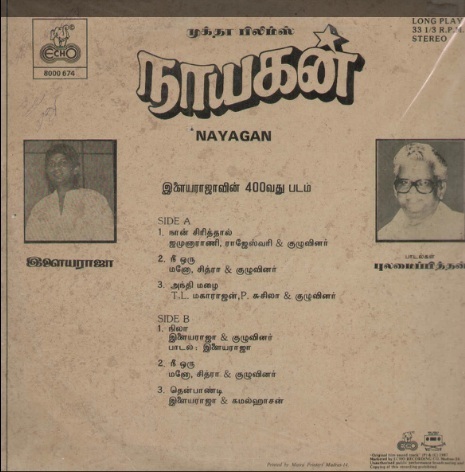 ^ "Velu Nayakan – Original Soundtrack". AllMusic. Archived from the original on 23 October 2014. Retrieved 19 October 2014. ^ "The classic Nayakan is 25 years old". Sify. 21 October 2012. Archived from the original on 22 June 2016. Retrieved 22 June 2016. ^ "வெள்ளி விழா கண்ட தமிழ் திரைப்படங்கள்" [Tamil films that became silver jubilee hits]. Thinnai (in Tamil). 20 March 2017. Retrieved 14 July 2018. ^ "Happy Birthday Mani Ratnam: 8 incredible films of the greatest director of all time". CNN-IBN. 2 June 2015. Archived from the original on 19 April 2016. Retrieved 27 October 2015. ^ "The 10th Habitat Film Festival 2015" (PDF). Habitat Film Club. Archived from the original (PDF) on 22 March 2017. Retrieved 22 March 2017. ^ a b Maderya, Kumuthan (3 November 2017). "Slumgod Millionaire: On 'Nayakan', the Godfather of Indian Gangster Films". PopMatters. Archived from the original on 28 November 2017. Retrieved 28 November 2017. ^ Krishnaswamy, N. (October 1987). "Authentic". The Indian Express. Archived from the original on 23 February 2018. ^ Jain, Madhu (15 January 1989). "12th International Film Festival: Commercial films dominate Indian Panorama". India Today. Archived from the original on 17 December 2017. Retrieved 17 December 2017. ^ Hardy 1997, p. 180. ^ "Bombay's Own Godfather". Bombay: The City Magazine. Vol. 9 no. 17–22. India: Living Media. 1988. p. 76. ^ "List of Indian submissions for the Academy Award for Best Foreign Language Film". Film Federation of India. p. 2. Archived from the original on 6 December 2013. Retrieved 23 October 2014. ^ "12 Indian films that would make great books". IBNLive. 12 February 2014. Archived from the original on 19 October 2014. Retrieved 19 October 2014. ^ Joshi 2006, p. 72. ^ Corliss, Richard (14 January 2010). "Nayakan". TIME. Archived from the original on 20 October 2014. Retrieved 20 October 2014. ^ Corliss, Richard (25 May 2005). ""All-Time 100 Best Films" – Nayakan". TIME. Archived from the original on 25 May 2005. Retrieved 20 October 2014. ^ "Mani Ratnam honoured!". Sify. 24 March 2005. Archived from the original on 14 October 2015. Retrieved 18 April 2012. ^ "TMA's 100 Greatest Movies of All Time". The Moving Arts Film Journal. 13 November 2010. Archived from the original on 20 September 2015. Retrieved 5 April 2013. ^ "India's 20 greatest films". NDTV. Archived from the original on 26 February 2012. Retrieved 5 April 2013. ^ Lakshmi, V. (18 January 2014). "After punch dialogues, it's punch song in Kollywood". The Times of India. Archived from the original on 19 October 2014. Retrieved 19 October 2014. ^ Devi Dundoo, Sangeetha (31 July 2012). "Poster boy". The Hindu. Archived from the original on 19 October 2014. Retrieved 19 October 2014. ^ Rangan 2012, p. 66. ^ Perumal, Azhagam (director) (2001). Dumm Dumm Dumm (motion picture). Madras Talkies. Event occurs at 1:45:29. ^ Chellamae Tamil Movie Scenes – Vivek Interrogates Mumtaz – Vishal – Reema Sen – Bharath. YouTube. 10 July 2012. Archived from the original on 6 June 2015. Retrieved 2 October 2015. ^ "Bosskey all set to launch new play". The Hindu. 14 October 2005. Archived from the original on 19 March 2007. Retrieved 2 October 2015. ^ Saraswathi, S. (8 March 2013). "Review: Onbadhula Guru is a collection of comic scenes". Rediff.com. Archived from the original on 6 February 2016. Retrieved 2 October 2015. ^ Lakshmi, V. (23 October 2012). "Muktha Srinivasan sends legal notice to Kamal". The Times of India. Archived from the original on 5 February 2016. Retrieved 5 February 2016. Gopalan, Lalitha (2002). Cinema of Interruptions: Action Genres in Contemporary Indian Cinema. British Film Institute. Hardy, Phil (1997). The BFI Companion to Crime. Continuum International Publishing Group. ISBN 978-0-304-33215-1. Joshi, Rajmohan (2006). Environmental Biotechnology. Isha Books. ISBN 81-8205-366-8. Rangan, Baradwaj (2012). Conversations with Mani Ratnam. India: Penguin Books. ISBN 978-0-670-08520-0.